CYCLING COMFORT - The LUPO® gel foam bike seat saddle cover enables you to focus on your form, endurance and strength as you work out with your bike instead of worrying about painful rides with a hard uncomfortable factory fitted seat pad. GEL FOAM SADDLE - The gel foam saddle offers a cushion between you and the sold base material below. After a time, your saddle will break-in and mould to you. Easing your discomfort in the rear. ONE SIZE FITS ALL - Designed to fit all sizes of standard bike seat including exercise-training bikes. 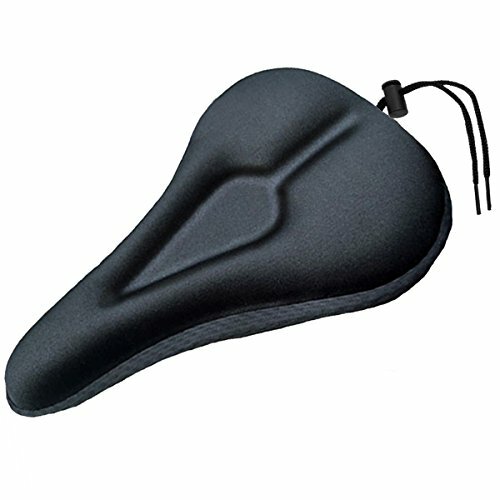 QUALITY - The LUPO® gel foam bike seat saddle cover has the gel foam housed between a moulded plastic base. Our covering material is Lycra to offer a truly comfortable cycling experience. This material will help to protect your legs from saddle sores from friction. Whether you use a bicycle or exercise bike long rides can be uncomfortable. The saddle on most bikes lacks sufficient padding therefore by adding LUPO's gel foam bike seat saddle you will experience a more comfortable ride. Our gel foam saddle helps absorb the bulk of the shock so your ride is less jarring on your joints. - Helps you focus on your form, endurance and strength. - One size fits all sizes of standard bike seat. - Quality gel foam design and Lycra cover with drawstring cords for quick and secure fitting. - LUPO® 12 Month warranty. ONE SIZE FITS ALL fits normal sized bike saddles including exercise bikes. See our images. QUALITY lycra material will help to protect your legs from saddle sores. If you have any questions about this product by Lupo, contact us by completing and submitting the form below. If you are looking for a specif part number, please include it with your message.